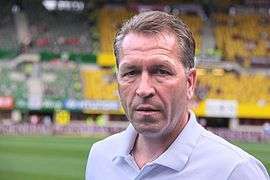 Andreas Köpke (German pronunciation: [anˈdʁeas ˈkʰœpkə], born 12 March 1962 in Kiel) is a German former football goalkeeper who was in the German squad that won the 1990 FIFA World Cup, and was also part of the 1994 FIFA World Cup squad. Though he did not appear in any of the matches, with Bodo Illgner preferred in goal, Köpke's chance to shine came soon after. Having been chosen as the best player in Germany in 1993, his biggest achievement came in 1996, winning the European Championship and playing a pivotal role in Germany's campaign (he saved Gareth Southgate's penalty kick and ensured Germany reached the final). Due to these achievements he was voted FIFA goalkeeper of the year. Köpke was also Germany's first-choice goalkeeper during their 1998 FIFA World Cup campaign, which ended in a 3–0 loss to Croatia in the quarter finals. Having already made his decision to retire at the end of the World Cup prior to the tournament, Köpke was true to his word; his retirement paved the way for another great German keeper, Oliver Kahn. In total, Köpke played 59 matches for his country. Köpke began his professional club career at Holstein Kiel in the summer of 1979, he retired from goalkeeping at 1. FC Nürnberg at the end of the 2000–01 2. Bundesliga season. He also played at Eintracht Frankfurt to where he transferred to from 1. FC Nürnberg in the summer of 1994, for the amount of €516,200, returning to 1. FC Nürnberg five years later via Olympique Marseille. Up to this day Köpke is still very much involved in German football. He currently is the goalkeeping coach of the German national team. He also acted as an ambassador to the city of Nuremberg, as it prepared for the 2006 FIFA World Cup. ↑ "Köpke, Andreas" (in German). kicker.de. Retrieved 7 August 2011. ↑ Matthias Arnhold (2 November 2002). "Andreas Köpke – International Appearances". Rec.Sport.Soccer Statistics Foundation. Retrieved 31 July 2012. ↑ Arnhold, Matthias (26 July 2012). "Andreas Köpke – Matches and Goals in Bundesliga". Rec.Sport.Soccer Statistics Foundation. Retrieved 31 July 2012. ↑ "A. Köpke". Soccerway. Retrieved 2 September 2014.